I've been looking for ages for a pair of wedge loafers or lace-ups with a heel at least 4 inches and no platform. My size is UK 8. Ebay, Amazon, Ali Express, DHGate.... no joy. Colour not important as I can dye them. If anyone can track a pair down I'd be eternally grateful. YESSSSSS. Where did you see them? Sadly, I didn't. I mucked-about with a similar style with a Paintshop program. 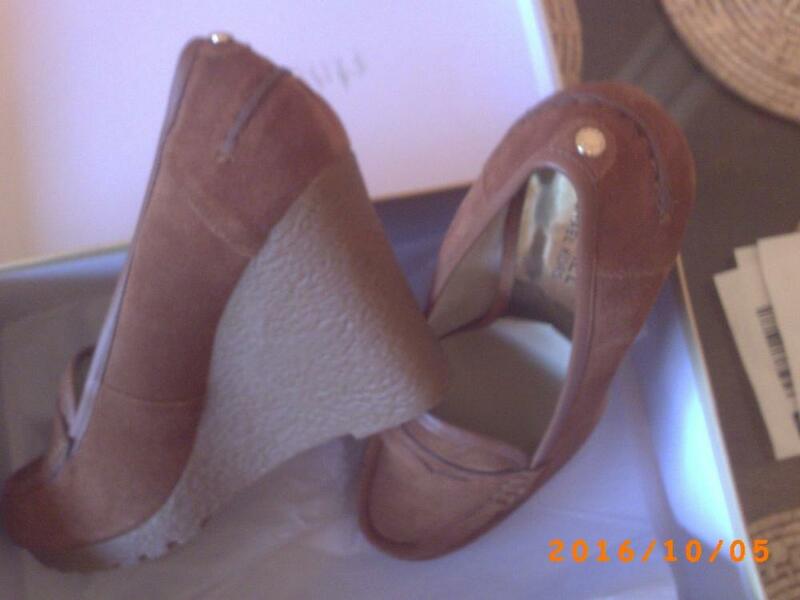 Originally the shoes came with a block heel. I had thought that with a sample, Google could find a similar photo which would in turn, find a maker. No such luck. Oooo. That's a shame. I thought for a minute... My wife doesn't like my block heeled Oxfords. She says they look like old women's shoes! Sorry, but I would have to agree with her. Apart from being worn by grannies, that type of shoe was a favourite with 1950s hospital matrons, schoolteachers, librarians and dowdy spinsters generally. I think the less critical term might be 'conservative', and I doubt many (ahemm) 'older' ladies would be walking hospital wards, school corridors, nor between book racks in 4½-5 inch heels. If you know of any, please let me know. I have a job for them as the next Mrs Freddy! Unless Russ will say otherwise, I would expect the 'conservative' front, with a strong heel (preferably a wedge in his case) is to camouflage his wearing of a high heel in close quarters amongst large groups of people. Mrs Freddy is pretty accommodating thankfully, but even she is less than keen if I look to be wearing an obviously 'girlie' style. In my mind, I'm looking for a safe heel, meaning one that isn't going to disappear down every crack in the pavement I'm on, nor announce to everyone within 50 yards, there is a heel wearer amongst them. 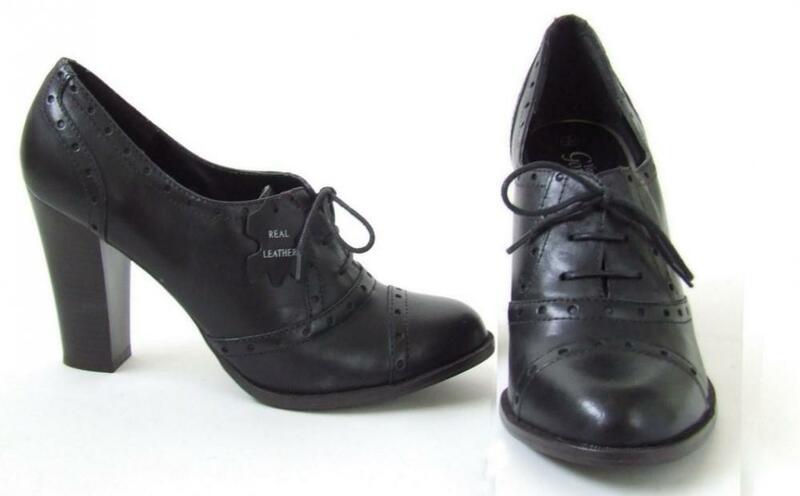 As plain and conservative as they look, these seem ideal for discreet high heel wearing by men. If they had fitted better, they might have been my 'everywhere' shoe. In places where I would be concerned about being spotted in a heel (almost everywhere) my main interest is being in a heel. "Looks", since at least 90% of the shoe remains hidden, is of less importance. Though I agree, the idea of wearing an 'ugly' shoe would be less attractive whatever the heel looked like. 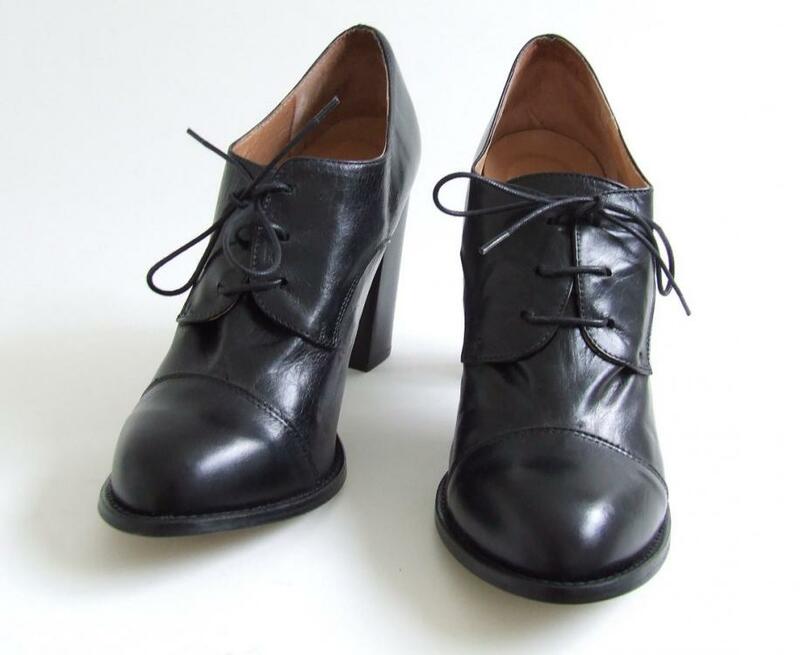 Russ referred just to 'block heeled Oxfords' (without saying anything about the heel height) and his wife referred to them as 'old women's shoes', implying that they were of a type actually worn by older women. 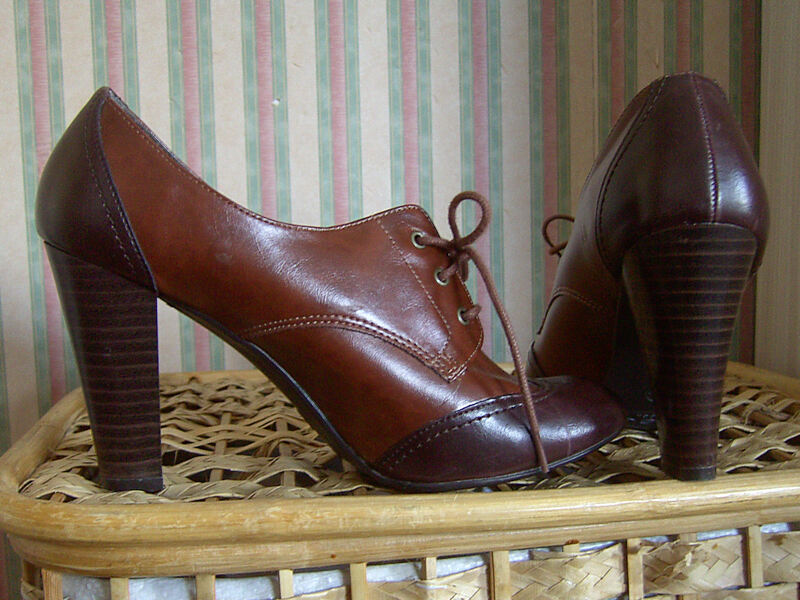 My comments related purely to that style of shoe as being often seen on 'matronly' women in the 1950s, with a very modest heel height (2.5" - 3" typically). Indeed, I can't recall seeing Oxfords with a higher heel than that until they allegedly became a fashion item again in more recent times. I do agree that, being essentially a very male (and ultra conservative) style of shoe, it would attract little or no attention when worn by a man, if the heel was largely hidden. I would not want to wear them as a fashion item - simply because I dislike the Oxford style of shoe (regardless of heel) - but I can understand anyone wearing them for the heel height alone. I will go further: my wife rarely wears heels of any significance nowadays (much to my regret) but I would not want to see her in a pair of 5" Oxfords, and especially not with a block heel and/or rounded toe. I may have been assuming, but I think I've read somewhere Russ typically wears heels 4½-5 inches high. Still not convinced about the 'older women' description, as my (possibly limited experience) suggests many/most 'older women' don't wear a heel at all? I think 'older style', as you say 1950's might be more accurate, but it's not a point we need to labour. I fully understand the notion they are not an obviously attractive style. Well, not for a lady anyway. 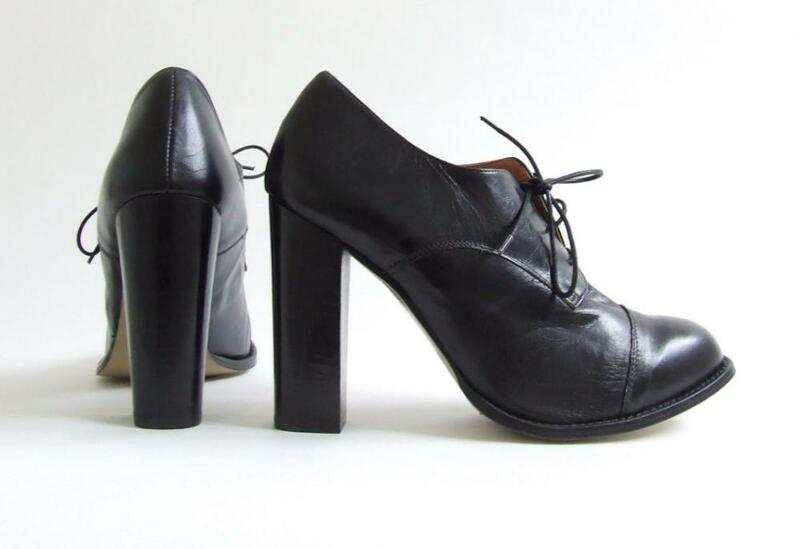 I agree that there is nothing to labour here but I do have distinct memories (mid-1950s) of the Oxford style (with modest cuban heel) being the 'sturdy' shoe of choice for uniformed or other women with little interest in high fashion but who nevertheless wanted to wear a heel. Their younger/more fashionable contemporaries usually wore fairly plain court shoes of various styles, including stilettos as they became fashionable. 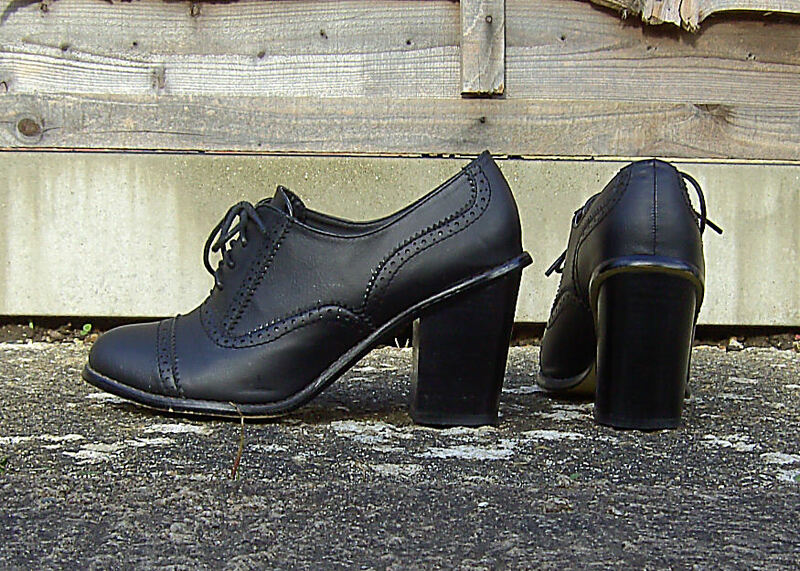 Prior to that (1930s/40s), the Oxford shoe would have been a very common choice for women of all ages as an all-purpose day shoe. And many women continued to wear them into old age simply because they were what they were used to, and comfortable. Hence the view that the clumpier Oxford style is (or was) essentially an old ladies' shoe, although rarely seen these days. We mustn't forget too that clothes rationing and shortages continued well into the 1950s and a sturdy lace-up Oxford, repaired as necessary, might have been all that many women owned (or could afford) for everyday wear. Having now seen the shoes in question, I find myself agreeing with the general (vocalised) consensus.... They need retiring. Haha! So now find me some elegant block heels if you can't come up with wedges! These are the only others I have, but my wife doesn't like these either. The heels are 4 inches, but you can see they're narrower. They came up a bit odd in size, in that I couldn't stop my foot slipping forward, so my toe made contact with the end of the shoe. Consequently, they were sold on. Listing #151957936563. Were they slightly cheaper, I would buy them. Why doesn't your wife like the two pairs shown? maybe she could help you find a pair you both like. I'm fortunate she tolerates my heels. I think it might be going a bit far to ask her to choose, but perhaps if a timely moment arrives, I could do that. Or show her pairs you would like and see how she reacts. OK, Won these on Ebay. Not as high as I'd have liked and a bit on the small side, but at least they're something like what I wanted. From Office, obviously. Listed as a 41 and UK 7-7½ I expect, because Office shoes do come up a bit on the small side. Oh dear! Those Office shoes look as though someone has attached a plank to the toe of a loafer and then bent it up at the heel to force in a mis-matching wedge. I like loafers but these are too fussy in front and too ugly and clumpy from the side - almost orthopaedic. Yes, I saw them and thought similar thoughts to yours! Did find this pair on Ebay. Size 7,5 10us so might be a touch on the small size. In the absence of high heel wearing opportunities outside, I've been wearing some rubber soles 4" wedges around the house as slippers. They are what are known as 'high-tops' or as what I have always known to be considered "baseball boots". They are are challenge to get on and off because of the lacing. Better designs have a side zipper too for easy on/off. Some of the styles shown here don't look too bad.